The state-run telecom operator is doing really well to get maximum users into it’s user-base. Few days ago, it launched the BSNL Data Tsunami plan and BSNL 118 Plan. And now it has came up with it’s all new BSNL Patanjali Plan which is especially made for the Patanjali members. So, in this article, we are going to talk about BSNL Patanjali Plan details and how to avail this BSNL Patanjali Plan recharge for your number. So, let’s get started. BSNL Patanjali Plan provides unlimited voice calling regardless of in which network you are calling to. And voice calls with this plan are truely unlimited. There is no hidden limit with it. Apart from that, users will also get 2GB of high speed data and 100 SMSes with this BSNL Patanjali Plan. The whole package comes with the validity period of 30 days. 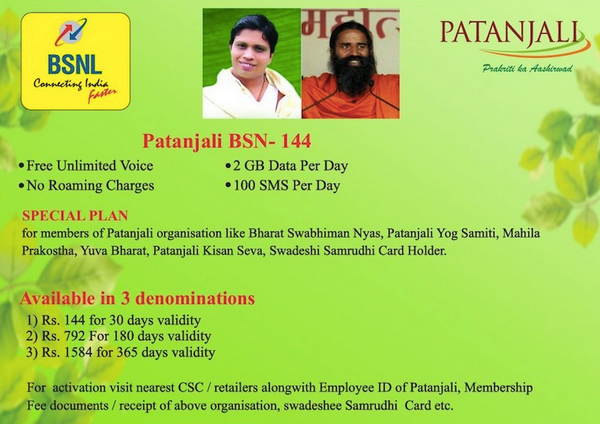 And the price of this new BSNL plan for Patanjali members is Rs 144 only. But the catch is, this BSNL Patanjali Plan is available only with the BSNL Swadeshi Samriddhi SIM cards which is introduced by the partnership between Patanjali and Bharat Sanchar Nigam Limited (BSNL). Basically, Baba Ramdev’s venture Patanjali believes in “Swadeshi”. So, they have partnered with BSNL which is a “Swadeshi” telecom network. And then they together introduced the “Swadeshi Samriddhi Sim Cards”. And the BSNL Patanjali Plan will be available exclusively only to these sim card holders. As of now, only the employees who work at Patanjali can grab these Swadeshi Samriddhi Sim cards. But very soon, these SIM cards will be available for people too. Apart from that, BSNL Swadeshi Samriddhi SIM card holders will also get medical and life insurance of Rs 2.5 Lakh and Rs 5 Lakh respectively. Who Can Get BSNL Patanjali Plan Recharge? As we mentioned earlier, this plan will be available for Patanjali members only. Here are the types of Patanjali members who can get BSNL Patanjali plan recharge: Bharat Swabhiman Nyas, Patanjali Yog Samiti, Mahila Prakostha, Yuva Bharat and Patanjali Kisan Seva. And Swadeshi Samriddhi SIM Card holders will also get this plan for recharge. For Patanjali employees, it’s already available. Rs 144 for 30 days validity. Rs 792 for 180 days validity. Rs 1584 for 365 days validity. Here you can see, if you recharge for 1 month only, then you will get it at normal price. But as soon as you recharge for longer period and pay single time, you get extra discount on final price. Like, if you do a single recharge for 6 months period, normal price should be Rs 864 (Rs 144 x 6), but you will get it at Rs 792 (Flat Rs 72 OFF). And if you do a single recharge for the whole year, normal price should be around Rs 1752 (Rs 144 x 12 months + 5 days), but you will get the same at Rs 1584 (Flat Rs 168 OFF). So, if you are going to use this BSNL Patanjali plan for a longer period of time, then we will recommend you to go for the 180 days or 365 days recharge as these will provide you extra savings. How To Get BSNL Patanjali Plan Recharge? First of all visit your nearest CSC or retailer. Show them any of the documents mentioned above. Submit the Xerox copy of your documents too. If you are a Patanjali employee, submit your employee id. You can show your Patanjali membership fee documents or receipt of above organisations too. If you have your Swadeshi Samriddhi Sim Card, then you might not need to submit any documents. Then ask for the BSNL Patanjali Plan recharge of your desired denominations. Pay the money and that’s it. BSNL Patanjali plan will be activated soon. Hope you have liked this article about BSNL Patanjali Plan details and how to get BSNL Patanjali Plan recharge. If you still have any doubt or any question in your mind. Please send it to us via commenting down below.